Lies on Your CV: Big or Small? Should You Come Clean About Them? #Infographic - Your journey to a new career. before submitting your resume. Lying that you have a degree when as a matter of fact you haven’t one, is just a no-no. You might be able to “land a job”, but sooner or later your employer will find out and may fire you. Not only that, you may be humiliated in the process by being reported to a database called Applicants Who Lied That Had A Degree. When it comes to lying on your excel skill set, it is just better to come clean as well. If the lie is small, you have a shot. But the job better not demand more than copying and pasting cell rows and lines because the only lines you will be filling are those at your local unemployment office. If the lie is big, you definitely will get the job but you also will definitely be fired. So there you have it, job applicants. 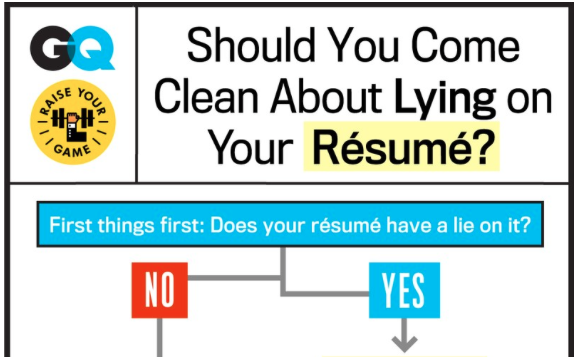 Some words of advice for you to take to heart the next time you are thinking about lying on your resume.